Brainiac 5 shows Supergirl his new invention, allowing her to see into the past. The viewer jumps around a few parallel time lines before latching on to the correct history. On Krypton, Lara goes into labor far earlier than expected. She gives birth to Kal-El and they are forced to place him in the rocket and save him from Krypton as it explodes. Jumping forward, Martha and Jonathan care for Clark as he grows up. Jumping again, Superman saves the space plane in his public debut. Later, he calls his mother about the rescue and tells her about Lois. Further on, Superman attempts to stop a scientist from destroying the city, but she is apparently killed in the process. Superman battles Amazo with the original Justice League. Further into the future, a married Lois and Clark discuss that they could probably never have children. They scan across the future until they find Supergirl's arrival on Earth. They see Superman take Supergirl to the Amazons for training, and later as he talks to Lois about worrying that he's too hard on her. Further in the future, Superman and Supergirl battle Blackstar, the end result of the scientist supposedly dying years ago. As she begins to win, Supergirl has Brainiac send her mind back to the fight. Taking control of Superman's body, Supergirl knocks Blackstar out and leaves a message before returning to the 31st century. As she returns, the viewer shows a glimpse of her future in the 21st century, of a city full of Kryptonians with her parents alive. 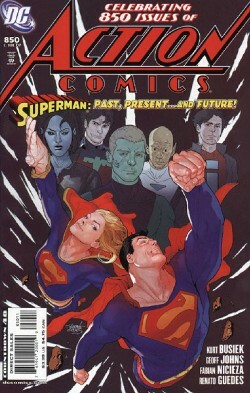 In the present, Superman and Supergirl fly Blackstar to prison, and wonder about the message burnt into the wall, telling him that he's not in it alone. Story - 5: Wow, issue #850. I remember when Action Comics #700 was a big deal. It took me a little while, but I really liked this issue. At first, the idea of yet another retrospective issue just turned me off. With all of the New Earth changes, we have seen far too many of them as of late. But something about this issue really appealed to me. First of all, I like the way they worked in Supergirl. It gave a real purpose for the flashbacks, and is one more step on the long road to fixing the Supergirl character (and wow does she need to be fixed). Beyond that though, the selection of flashbacks worked quite well to clarify some of the lingering questions about New Earth and its affect on Superman. The lateral timelines shown at the beginning are interesting simply because they imply that the golden age, silver age, and post-crisis Supermen all still exist on the 52 worlds in the multiverse. No more birthing matrix. A poor decision in my opinion, but at least it got clarified. Luthor in Smallville is another bad one, but this at least gives us an idea at how long he was there. But saving the space plane (the Constitution if memory serves) is an excellent addition. Byrne had a lot of great concepts in Man of Steel, and it's nice to see that not all of them have been trashed in favor of Silver Age concepts. Of course, this seemed to indicate that the fantastic "they all wanted a piece of me" moment didn't happen, but I suppose that Clark could have been telling Ma about a different event, so I'm just going to believe that it still did. The fight with Blackstar really worked for me on two levels. First, it was nice to see them take advantage of the time-skipping to tell the beginning and end of a self-contained story within this issue. Second, and more important to a geeky, long-time reader like myself, I really enjoyed the reference to Berkowitz as Mayor. Wasn't he eventually assassinated by Luthor? I wonder if that's still in continuity. The Justice League moment was cute, but didn't really seem to matter much to Superman. Sure it underscores the fact that he's alone, but beyond that it was just kind of a waste of pages. The rest of the book really focused on Supergirl and his feelings for her. And that was nice to see because, as previously alluded too, the Supergirl book and character is a mess and she needs all the help she can get. Overall, this issue managed to be the standard recap anniversary issue, without falling too much into the standard clichés. Good work by all three writers. Art - 3: I'm normally a big fan of Guedes' art, especially his work with the coloring, but something about this issue just didn't work for me. I think it started to go south with the incredibly ugly baby Kal, and it didn't really improve. There really wasn't anything wrong with it in particular, but his work has definitely looked better. Cover Art - 3: This is a really generic cover, especially for an anniversary issue. The 850th issue of Action Comics should have something iconic on the cover. For examples of said iconic imagery, see Adventures of Superman #505. Either of them. That gripe aside, its not a bad cover, and it does get points for maintaining a general cover design while still representing the specific story. Average, but it could have been worse.